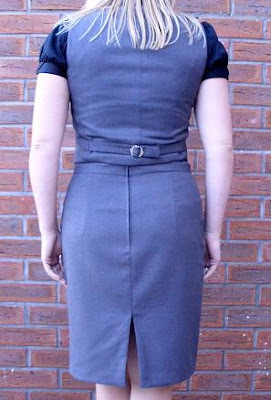 This is part number 2 of the suit, the franzi waistcoat. I'm thinking that i really don't need the bust darts..they just look untidy...and it could be a little longer...might be a little more flattering. Please ignore the fact that i look like a chunky prison guard in this photo...i was trying to show the waistcoat...i was not thinking about posing elegantly. I made the back piece out of suiting as well, instead of the usual silk panel, because i won't always be wearing a jacket with it.